Kaden is a gamer, in all aspects. The Nintendo Wii, PSP, Nintendo DS, and the Nintendo 64 all receive heavy rotation in our home. His father and I do not mind him playing games. It could have something to do with our love for them as well. Ian has spent hours, and even lost sleep, playing the game CSI:Hard Evidence on the Nintendo Wii. At one point I though he was going to make a career change and become a Crime Scene Investigator. For now, we'll just live vicariously through animated characters. Gaming systems are not the only source of entertainment for children. 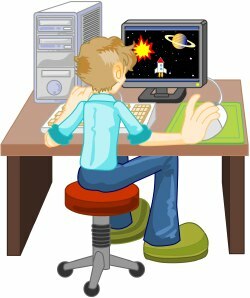 Nowadays, the computer and Internet offer numerous opportunities for children to explore their creative, imaginary, and playful side through the use of online games. Kaden is a master on the computer. I'm sure you think I am exaggerating when I speak of his computer intellect. However, he is able to navigate his way on the Internet like a child of middle-school age. There are times when I go to him for advice if I am having a problem finding one of his favorite sites. He typically plays on harmless gaming sites such as CartoonNetwork.com, HotWheels.com, or Lego.com. But the Internet is a large place, and parents cannot monitor what appears on the screen as our children play. Thank goodness there are resources available to help aid in keeping our children safe. Welcome, The Online Mom. If you need tips and advice on how to keep your child(ren) safe while online, you have got to visit this site. Monica Vila, who is the founder and Chief Technology Mom, will tweet at tonight's #TheOnlineMom SiteWarming party sponsored by ResourcefulMommy (Amy Lupold Bair). Whatever questions you may have concerning safety, fun games to play, how to monitor your children, please have them ready. The fun starts at 9pm EST until 10 pm EST, but you don't have to wait until then. Start tweeting the hashtag #theonlinemom now. Do not think for one moment that it is all work and no play. FIFTY, yes I said FIFTY, lucky people will win a copy of Gold's Gym Cardio Workout for Wii. Visit ResourcefulMommy for more details on how you can snag a copy. To get an early start, go follow @theonlinemom on Twitter to see what she has to say. Who knows, she may save your child's life!